The COURhouse, the third Building Institute neighborhood infill home, was constructed this summer with 15 graduate students and 10 undergraduate students under the direction of Professor Gjertson and Assistant Professor Kivett. 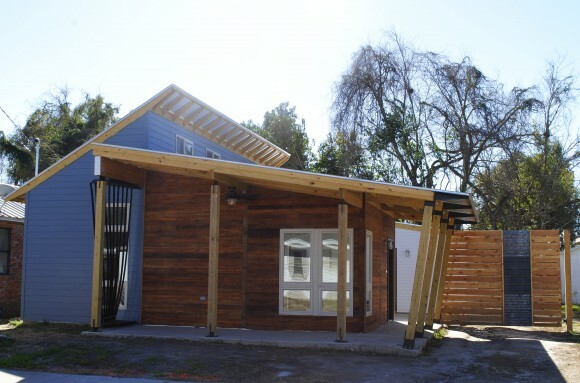 The Building Institute is a program that strives to regenerate communities around Lafayette by building affordable, sustainable homes on empty lots within neighborhoods. The construction of the COURhouse is a joint effort between the UL Building Institute, Ragin Cajun Facilities and the Lafayette Public Trust Financing Authority (“LPTFA”) with construction financing funded by renewable zero interest loan from the LPTFA. The COURhouse is a three bedroom, two-bathroom 1,500 sq. 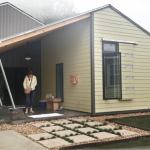 ft. home, located in the Freetown neighborhood between downtown Lafayette and the University, on 324 Jackson Street, across the street from last year’s Design+Build home, the NEXThouse. The “COURhouse” name comes from the home’s prominent feature, a centralized courtyard connecting the living room and kitchen to the outdoors, offering residents a sense of openness and spaciousness. The courtyard is accessible through a large 10’ x 7’ glass roll up door from the kitchen, two sliding glass doors from the living room, and French doors to the master bedroom. The front porch is wrapped in reclaimed cypress wood from an 1800’s home in Arnaudville, donated by Mr. Jeff Simeral. Clerestory windows and sliding glass doors allow light to flood into the spacious living room and the kitchen’s 16’ vaulted ceilings. A large exposed beam runs through the living room extending out to the front porch and exposed rafters line the living room ceiling. The interior finishes give the home an industrial feel with concrete floors, custom concrete countertops, reclaimed corrugated metal, and steel angle backsplashes. 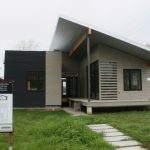 Sustainability features of the home include a 4 kw PV panel system on the roof, an instantaneous gas heater, advanced wood framing, and energy efficient appliances. The COURhouse was designed by architecture students Barrett Bertrand, Nicholas Clesi, Abigail Comeau, Daniel Ferg, Liran Timianski, and Jennifer Young and was built by 25 students, in conjunction with J.C. Dugas Construction Associates, Inc.